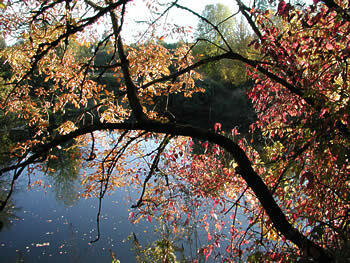 After a late lunch I went toward Hillsboro to see Jackson Bottom Wetlands Preserve. I wasn't sure what to expect, but a couple or seven things made it worth the trip. The tranquility and clear air made me feel close to nature. There were not many other visitors, generally a bonus when engaging the outdoors. There was an enormous geese migration to behold. I'm guessing there were several thousand birds flying overhead. From a distance, they looked almost like swarms of bees or black dust. It was an incredible sight to see. I only wish I had the camcorder. My 3X optical zoom simply doesn't cut it for still shots. I was impressed with the size of the preserve. It seems to span for miles. I walked until the sun neared the horizon, and it began to get rather cold. The path continued on. My first attempt to navigate the paths was rather humorous. There are literally dozens of intersecting paths. Sometimes there was a three way fork in the path with no explanation or signs. I went in a zigzag circle and came back to the beginning. One more try after a glance at the map and finally a path that went out a good distance, near the man-made lake and beyond. I don't know if the geese migration is a predictable event, but I'd consider going back with the camcorder to better capture it. Jackson Bottom will not occupy an entire day, but if you're ever in the area, make sure to stop by. For more photos from Jackson Bottom, see the photo album.